The pistachio (Pistacia vera L., Anacardiaceae) is a small tree native to some regions of Syria, Iran, Kyrgyzstan, Greece, Turkmenistan, Turkey, Pakistan and Afghanistan, that produces an important culinary nut. Pistacia vera often is confused with other species in the genus Pistacia that are also known as pistachio. These species can be distinguished from P. vera by their geographic distributions (in the wild) and their nuts. Their nuts are much smaller, have a strong flavor of turpentine, and have a shell that is not hard. 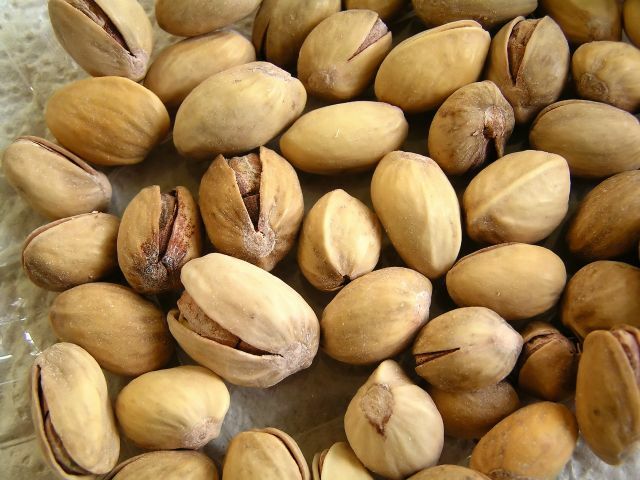 The word pistachio is a loanword from Persian via Latin, and is a cognate to the Modern Persian word پسته Peste.